Gourmet Cooking | Gourmet Cooking Made Easy! 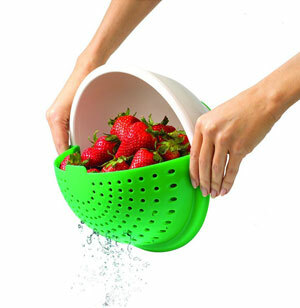 The Good Cook Soak & Strain Colander is an ingenious tool to wash fruits, vegetables, and more in one easy motion. It drains off excess water once you wash them, making them ready-to-eat. The bowl allows for full soaking to thoroughly clean your ingredients while the colander attachment easily strains the contents of the bowl without spilling. The 2-in-1 design makes cleaning fruits and vegetables fun and easy. Its soft, non-slip base keeps the bowl steady on your countertop - and best of all, the colander detaches into the bowl for easy storage. It is the perfect tool for quick and easy food prep. The "Bowlander" is a helpful kitchen secret you will be happy to share. Colander attachment easily strains the contents of the bowl without spilling. Nesting design for convenient and compact storage. Soft, non-slip base keeps the bowl steady on your countertop. 2-in-1 design makes cleaning fruits and vegetables fun and easy. Use for fruits, vegetables, even pasta. Just wash in the bowl and tilt to strain. Length: 10 in. x Width: 10 in. x Height: 5 in. Contact © Copyright 2019. All Rights Reserved. Other terms, conditions, and restrictions may apply.